Qatar, July 29, 2018: With a vision to upgrade and enhance the global financial knowledge landscape of Qatar’s finance professionals, Qatar Finance and Business Academy (QFBA) held the IFRS free informative seminar in partnership with the Institute of Management Accountants (IMA) Qatar chapter. The seminar took place on July 24, 2018 at Marriott Marquis City Centre and was followed by a CMA info session in the presence of Mr. Moamen Omar, President of IMA Qatar chapter, as well as QFBA representatives. 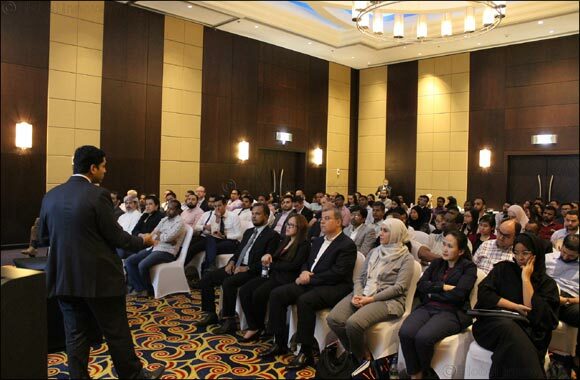 Over than 100 professionals took part of the insightful seminar from the financial sector, marking a milestone by QFBA and IMA’s Qatar chapter in supporting the development of human capital to keep up and live up to Qatar’s 2030 vision. The session divulged on the scope and expanse of IFRS 9, moderated by Mr. Kashif Parves, ACCA, Audit Director, KPMG Qatar, the session offered insights into the changes that would be applicable from the previous accounting standard, IAS 39. This was followed by an introduction about the Certified Management Accountant (CMA) of Qatar Finance and Business Academy, which was conducted by Mr. Moamen Omar, President of IMA Qatar chapter along with Mr. Richard Ali, vice president of IMA Qatar chapter. It provided insights in terms of its content specifications; eligibility criteria; entrance exam; fees of the program; and offered practical tips & strategies to perfect the entrance test. “In continuation to Qatar’s National Vision 2030, QFBA has been taking several initiatives which are linked towards giving a financial muscle to Qatari professionals. Collaborating with IMA Qatar Chapter’s seminar of IFRS is yet another endeavour towards reaching that goal and making our new generation acquainted with the global financial policies’ landscape. We are certain that hand in hand with IMA global, we will be opening up a new chapter of learning of a global exposure”. QFBA’s training programs match the needs of experienced professionals, new employees and – more recently – school graduates, and provide them with specialized educational and training courses in their fields of finance and banking, to help them develop their careers and achieve the best results. The Academy ensures that its programs are interactive so that participants can apply everything they have learned in the work environment effectively. QFBA is committed to fulfil its mission of raising the financial services industry standards and helping organizations and professionals in the country in achieving their learning and business objectives, in addition to its contribution to the realization of the Qatar National Vision 2030, through the development of Qatari talents, increasing human capital capacity and raising the bar of performance in the country’s financial sector, as the State transforms into a knowledge-based economy.